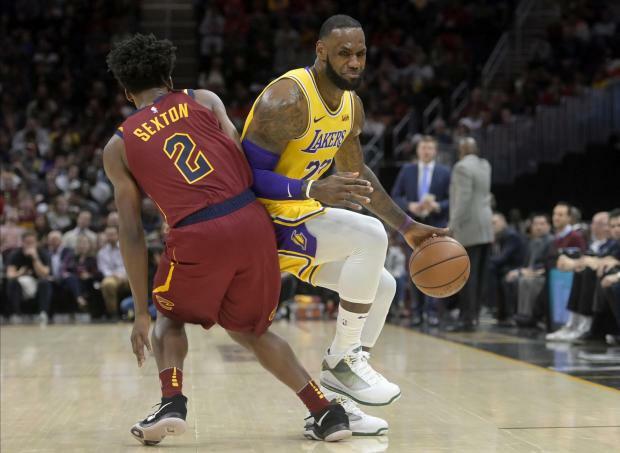 LeBron James scored 32 points, grabbed 14 rebounds and dished out seven assists to lead the Los Angeles Lakers to a come-from-behind 109-105 win over the Cavaliers on Wednesday in his return to Cleveland. The Lakers, sparked by James, went on a 16-3 run late in the fourth quarter to erase a 99-91 Cavaliers lead. All five Los Angeles starters scored in double figures, and Kentavious Caldwell-Pope added 13 off the bench. The sellout crowd at the Quicken Loans Arena gave James a rousing standing ovation during the team's introduction, thanking him for bringing Cleveland its first championship -- a memorable title over Golden State in 2016, ending a 52-year drought. After the game, James said, "To come back and get the reception that I got tonight, it means a lot to not only myself, but for my family and friends that were here tonight, and my family that's back home in L.A. as well." Dennis Schroder scored 10 of his game-high 32 points in a second-quarter run that gave Oklahoma City the lead for good in a blowout of Golden State at Oakland, Calif. The Warriors have lost four straight for the first time under head coach Steve Kerr. Russell Westbrook recorded a triple-double (11 points, 11 rebounds, 13 assists), Steven Adams and Jerami Grant had double-doubles, and Paul George poured in 25 points as the Thunder used balance to overcome a two-man show by Golden State's Kevin Durant and Klay Thompson (27 points apiece). The only downside for Oklahoma City was an ugly injury sustained by Hamidou Diallo. The rookie landed awkwardly on his left leg midway through the fourth quarter and was taken off on a stretcher. James Harden scored 29 of his game-high 43 points in the second half, and Houston extended its winning streak to five games with a victory over visiting Detroit. Harden finished 10 of 20 from the floor and 19 of 19 from the foul line to offset a strong performance from Pistons forward Blake Griffin, who scored 19 fourth-quarter points en route to a 37-point, 11-rebound effort. Griffin hit 6 of 9 3-point attempts but also committed nine turnovers. Andre Drummond added a double-double for the Pistons with 20 points and 11 rebounds. His counterpart for Houston, Clint Capela, also recorded a double-double (27 points, 15 boards). Joel Embiid outdueled Anthony Davis as host Philadelphia extended its winning streak to four games and ended New Orleans' streak at three. Embiid had 31 points and 19 rebounds, Ben Simmons added 22 points, Landry Shamet came off the bench to score 15, and Jimmy Butler, JJ Redick and Wilson Chandler scored 13 each. Davis, who scored his 10,000th career point, finished with 12 points and 16 rebounds but missed a free throw that would have tied it with 2.5 seconds left. Jrue Holiday and E'Twaun More scored 30 apiece, and Holiday added 10 assists for the Pelicans, who had won six of their past seven. Marc Gasol converted the game-tying and winning free throws with 0.7 seconds to play as part of his 20-point, 10-rebound performance, and Mike Conley poured in 30 points with nine assists as visiting Memphis outlasted San Antonio. The lead see-sawed over the final 3 1/2 minutes until San Antonio's DeMar DeRozan canned a contested jumper over Conley with 1.2 seconds remaining. After a timeout, Memphis got the ball to Gasol, who was fouled by San Antonio's Rudy Gay with 0.7 seconds to play and calmly made the free throws. JaMychal Green added 12 points off the bench for Memphis, which has won five games in a row and seven of its past eight. DeRozan led the Spurs with 24 points and Gay added 21 for San Antonio, which has lost five of its past six games. New York stunned host Boston with a 27-7 flurry in the second quarter, then held on for victory over the struggling defending Eastern Conference runners-up. Trey Burke, Noah Vonleh and Enes Kanter all recorded double-doubles as New York, which had lost six straight, dropped Boston back to .500 at 9-9. Burke led all scorers with 29 points to go with a season-best 11 assists for New York, which had lost four straight on the road. Kyrie Irving had a 22-point, 13-assist double-double for the Celtics, who have lost three straight overall and two in a row at home. Giannis Antetokounmpo collected 33 points, 16 rebounds and nine assists as Milwaukee pounded visiting Portland. Khris Middleton added 21 points and seven rebounds for the Bucks, who won their third straight game, leading by as much as 46 in the fourth quarter. Damian Lillard and CJ McCollum each scored 22 points for the Trail Blazers, who played the second of back-to-back games after a 118-114 road win against the Knicks on Tuesday night. Jamal Murray scored 18 points, including two free throws with 6.8 seconds left, and Denver beat Minnesota at Minneapolis. Paul Millsap scored 12 of his game-high 25 points during a decisive third quarter, and Gary Harris had 17 points for Denver. Karl-Anthony Towns had 22 points and seven rebounds, and Derrick Rose had 20 points off the bench for Minnesota. Kemba Walker was good but not great, yet the rest of the Charlotte team responded with one of its best performances of the season in a rout of visiting Indiana. Walker, the NBA's leading scorer at 29.6 points per game, finished with 16 points and 11 assists for his first double-double of the season, sitting out the entire fourth quarter after the Hornets led by as many as 26. Jeremy Lamb led the Hornets with 21 points, including five 3-pointers on a night when Charlotte hit 18 3-pointers, two shy of a franchise record. The Pacers were without their leading scorer, Victor Oladipo (knee), for the second straight game. Kyle Lowry had a triple-double, and Jonas Valanciunas scored a season-high 24 points as Toronto won at Atlanta, handing the Hawks their ninth consecutive defeat. The Raptors won their third straight and played without Kawhi Leonard, who has not played in any of the team's second games in back-to-back situations this season. Lowry scored 21 points to go with 12 rebounds and 17 assists, the latter matching his season high. Toronto also got 22 points from Pascal Siakam, one shy of his career high, and 19 points and nine rebounds from Serge Ibaka. Atlanta got a season-high 26 points from Jeremy Lin. Vince Carter scored 14 against his former club, including his 25,000th career point. He is the 22nd NBA player to reach the milestone. Willie Cauley-Stein scored 23 points, while De'Aaron Fox added 17 points, 13 assists and seven rebounds to help Sacramento pull away for a win over Utah in Salt Lake City. Nemanja Bjelica added 18 points, which included a trio of critical 3-pointers, for the Kings. Sacramento prevailed after shooting 52.8 percent from the field and 44 percent from 3-point range. Donovan Mitchell poured in 35 points to lead Utah. Jae Crowder added 16 points off the bench, while Rudy Gobert chipped in 13 points and 15 rebounds. The Jazz lost for the fourth time in five games. A fourth-quarter burst from reserves J.J. Barea and Devin Harris allowed Dallas to record a victory over visiting Brooklyn. Harris and Barea scored Dallas' first 12 points of the fourth quarter and combined for 17 in a row going back to the third. Their outburst paced a 16-6 Mavericks run for a 103-93 advantage after the Nets had fought back from a 14-point deficit to tie the game. Barea and Harris each scored 18 for Dallas, while Harrison Barnes scored a game-high 28 points and was also clutch late in a close game, contributing seven points in the final 6:35. Brooklyn was led by Allen Crabbe's 27 points. Zach LaVine scored 29 points on 10-for-20 shooting, and Bulls held on for a win over visiting Phoenix. Jabari Parker added 20 points, 13 rebounds and eight assists for Chicago, which snapped a four-game losing streak. Ryan Arcidiacono (14 points), Antonio Blakeney (14), Wendell Carter Jr. (14) and Justin Holiday (11) also scored in double digits for the Bulls. Devin Booker led the Suns with 23 points and six assists, and Deandre Ayton recorded his 10th double-double in 17 games, finishing with 18 points and 12 rebounds, plus five assists. Phoenix lost its third consecutive game and dropped to 0-8 on the road.